Casual dressing needn’t be boring. I rarely go out out these days and instead a prefer more casual days out or smart afternoon teas with my friends than clubbing. I went through a phase years ago where I was only ever seen in either work clothes or a party dress but as times have changed, so has my style and for me right now, I’ve got my casual wardrobe pretty much nailed. Getting casual outfits right is as much about knowing your own style as it is about whats in your wardrobe. I know where I went wrong for years and now I know that I need plenty of basics in my wardrobe that are in my style with plenty of pieces that I can mix and match together. Jeggings for me are a wardrobe staple as they can be dressed up or down to suit the occasion. The Curves High Waisted Blue Jeggings are an absolute godsend if you’re looking for total comfort while remaining stylist but they’re also great for those who, like me, struggle to find jeans to fit the waist without being like bell bottoms on the legs. 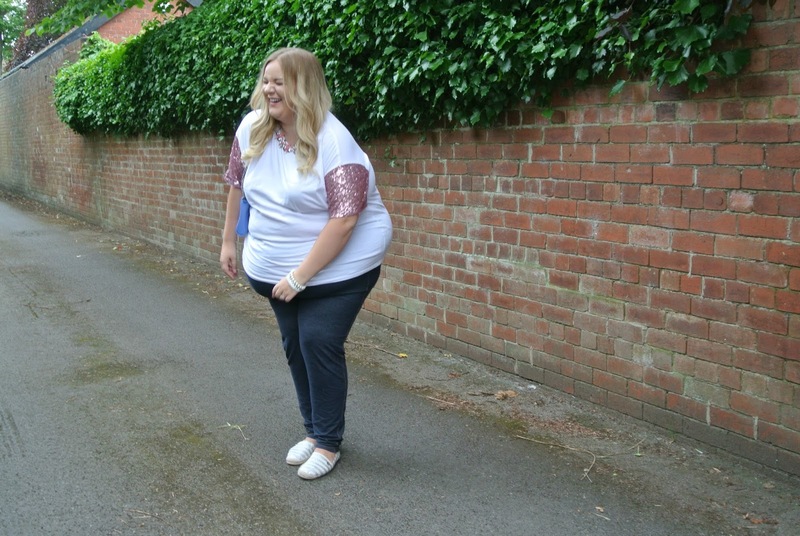 I love to add a touch of sparkle to my daytime outfits with fun pieces like the ASOS Curve T Shirt with Sequin Sleeves. This top is a cute and girly twist on a classic white T that adds a little something extra to an outfit without making it better suited to the evening. T Shirts are a great wardrobe basic and I’d suggest having plenty to choose from in colours that compliment lots of different pieces in your wardrobe. Casual dressing is all about being quick and easy; you shouldn’t need to be spending ages putting together an outfit. Its all about having lots of pieces that you can pair together to create a relaxed daytime look rather than a statement, stand out evening outfit that you may only wear a couple of times. T Shirts are ideal for wearing during the day as part of a casual outfit, can be made a bit more special with a statement necklace like mine in this post which is from Next and they’re also great for wearing for evenings out if you tuck them into a skirt or trousers etc. If you’re wanting something that you can wear again and again then I’d look for a higher quality piece, if you’re just wanting something to throw on during the day then quality isn’t as important in my opinion. I find that ASOS do basics really well as the T Shirts are quite thick, not see through and are priced very reasonably. I tend to take the same approach when it comes to choosing footwear in that I like to buy really great quality pieces that will look good for a long time but I don’t like to spend all of my budget on them. Spending is all relative I suppose but I doubt you’d ever see me spending hundreds or thousands on a pair of shoes because I wear my shoes out and if I’m going to spend a lot of money, then I like to reserve it for my handbags, like this gorgeous Rebecca Minkoff Mini Mac which adds a quality pop of colour to a daytime outfit. I do however see the benefit in paying a bit more for my shoes as they tend to have more of a structure to them, are more comfortable underfoot and look good for longer. Years ago I used to buy tonnes of shoes from Primark and while I think their summer sandals are great, I don’t think that their shoes are good quality and their ballet flats, etc would always end up smelly and battered looking. Now I try to find styles that I really like and should continue to like the following year, from a well made brand and I tend to buy them on sale to save some extra money. I picked up the Michael Kors Kendrick Flat Slip On Espadrilles from House of Fraser on sale for an absolute bargain at around £59, down from over £100 and they even went to less than that by the second sweep of the sale! I love the touch of sparkly silver in the striped design; my hubby calls these my Fimble Shoes. I’d been looking at some highstreet ones and when I spotted these on sale, they ended up being only £4 more expensive than the ones I’d been looking at, plus they were far more comfortable. Lots of these have gone in the sale and I’ve linked plenty below for you to check out. While I love the look of the Chanel espadrilles but I think they’re far too expensive as I’d wear them loads and wear them out. Granted that cost per wear, they’d work out really effective, I hate the thought of ever having to throw something designer away but if I wore them so much that they wore out, there wouldn’t be much point in keeping them. I’d rather get the espadrille look with these high quality Michael Kors ones and save the rest of the money towards a handbag. My final trick for nailing girly, casual outfits all comes down to having a great selection of gorgeous jewellery to choose from. I love mixing sparkly, statement pieces from the highstreet with pretty higher end pieces that are more dainty in styles that will last a lifetime. My bangles in this post are from StudioB which is a little boutique in Sunderland city centre that sells the most gorgeous, unique jewellery. They sell on Facebook too so if any of you want to purchase these silver bangles yourself, they’re £5 each so just pop Sara who owns the shop a message. I just pair them with a Primark pearl bracelet which cost next to nothing and they create a gorgeous look together that isn’t too much for the daytime and they look equally as good when worn at night too. What are your favourite daytime, casual outfits to wear? *Thanks to Sarah at Plain Sarah Jayne for taking my blog photos! Sometimes its great to dress casually and I love your shoes they look comfy and are cute. Double points! I don't do casual, or at least do it well… Love that T-shirt though; think I'll try to work it into my wardrobe somehow! I love the T! Really pretty and like you say jazzes up the day time wear. I hate my bingo wings so T shirts are my friend 😉 I dug out my espadrilles last month from the back of the wardrobe – now my son constantly shouts 'what are those!?' at me… I love them, comfy comfy comfy! The flats look great. i'd like some like that. I also like the sparkles on the top. Skinny jeans and long loose tops, that's how I do it. Loving your slip on espadrilles, how much were they? I can't believe you got the shoes for such a song! I love jeggings as well. They feel like a second skin – so comfortable. This is so weird but I never ever dress casually unless I'm in the house and then it's just ridiculously casual! I always wear heels/boots and dresses! But I need to start dressing casually! Casual is the only look I wear really haha. I am the queen of jeans and a t-shirt. I love a good t-shirt, especially if it's a bit fancy! I agree that a nice piece of jewelry can make any outfit look like you going for a night out! I love the sequined sleeves on the top, so cute! Love a bit of sparkle! Cute outfit, I love the sleeves! I am in love with those shoes! They're amazing!! I dress casual on weekends all the time its just so comfy!! Plus you look great and I love the shoes they look supper cute!